This is a general (though simplified) scheme of what includes the concept of open government. This is a very broad concept that is general understood as transparency, or accountability. Sometimes it is taken as government 2.0, as the institutionalization of the web 2.0 and politics 2.0. Some other times it is just confused by mere e-government. But it is much more than that. And here I try to present a first version of an attempt to relate all the concepts that fall under the big umbrella of open government. 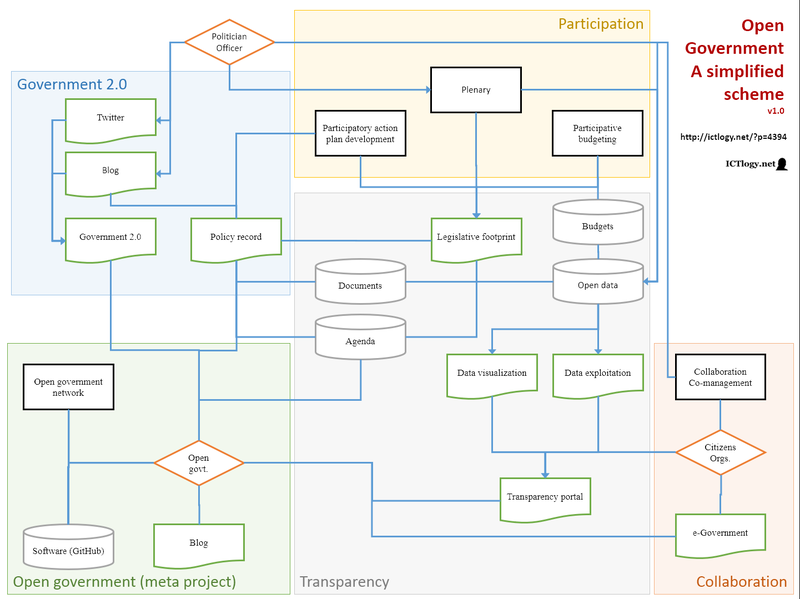 Please note that all the scheme is open government: what is pictured in the lower left corner, “Open government (meta project)” is how the project itself is presented to the citizen, with its own blog, its own software repository and other institutional relationships with other governments. The scheme is not comprehensive, but just aims at highlighting the main components. Orange rhombuses picture agents: politicians, officers, individual citizens, civil society organizations, and the open government team in a given government. Black rectangles are processes where decisions are made. Green rectangles with the curved lower edge are outputs or presentation of information. Gray cylinders are databases or data silos. Arrows do not have a very accurate meaning. In general, all links are bi-directional: information flows in both ways. When there is an arrow, it implies that information only flows in the sense of the arrow — this look cleaner that double arrows, which would have populated the whole scheme. But, as said, it is more a way to stress some points (e.g. the politician feeds its Twitter account) rather than being a strong statement. All comments are more than welcome. Peña-López, I. (2016) “Open Government: A simplified scheme” In ICTlogy, #149, February 2016. Barcelona: ICTlogy. Previous post: Are assembly-based parties network parties? This is great Ismael. Thanks for posting. One question: politician/officer is explicitly represented in your scheme but I see no individual citizens visualised? Citizens stands for the individual one, and orgs. for organizations, that is, the organized civil society. Maybe I should have written “Citizen”, in singular. Thanks for this scheme. In the area of “Transparency” there is a cylinder named “Documents”. What kind of documents do you mean? A whole publication made from “Government” or only official documents. My question is completed to know if in Blog and Twitter can also be spread documents produced specifically to communicate with citizens. Thank you. Academic literature, that frames the topic. Gray literature (e.g. reports) that analyzes the general framework of an issue or addresses specific policy proposals (e.g. from think tanks, international organizations, etc.). In depth studies that analyze the specific topic at stake (usually from officers in the government, directly or indirectly through consultants). Any kind of documented evidence coming from the daily life of the civil society: blog posts, aggregation of Twitter conversations, etc. For instance, I need to know what are the definitions of every shape, do you have any explanation about that?, and what are the difference between connections with or without arrows? For my point of view, an Open Government is a “new” way to understand the relationship between government and citizenship, it’s difficult for me to see this new relationship in your scheme (sure it’s my slow to understand it). Marc, I updated the post with some of the information you were inquiring for. As for the new way to understand citizen-government relationships, I agree with you. But it is my feeling that these new relationships are not based in the formal way they take place, but on what happens underneath the surface. And this is what I am trying to do here: uncover what is happening underneath. Thus I present the policy record, the legislative footprint, open data and all other things that actuallyl feed the new relationsips, which may happen as usual (in plenaries), as the recent usual (with politics 2.0 tools) or in brand new horizontal ways as in collaboration platforms (e.g. self-managed civic spaces).